Does our life depend on luck? Do you believe in destiny? Can people tell the future? What are the best lucky charms and omens? Gautama Buddha was asked these questions in the Mangala Sutra. However, he chose not to talk about how people take refuge in superstitions, fortune telling or lucky charms, activities that he referred to as ‘low arts’. Instead he gave us thirty-eight ways we can act, in order to take responsibility for our actions and change our lives for the better. If he did not believe in superstitions and omens, what did he believe in? He believed in individual responsibility, rational thought and social obligations, and this is what he covered in the thirty-eight principles in the Mangala Sutra. These thirty-eight principles will gradually lead us on a journey that will see us reforming ourselves and help turn us into responsible people within society. They will also help us find happiness and ease our suffering – something I believe we are all searching for. 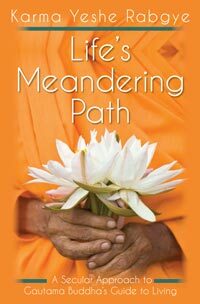 Karma Yeshe Rabgye, in his latest book, Life’s Meandering Path makes the Mangala Sutra relevant in our lives today, he shows us how to juggle individual challenges, family obligations, social responsibility and achieve personal growth while maintaining a vital sense of balance in the midst of a chaotic world. In a nutshell: this book is a guide to life. It is not uncommon to experience a sense of fear or uncertainty in the often-times frantic, fast-paced world in which we live. But it is possible to move beyond those obstacles and that feeling of being overwhelmed, into a state where happiness and a lack of suffering dominate. This can be achieved by reading, contemplating and implementing the thirty-eight principles detailed in this book. With advice and exercises firmly planted in real life, Life’s Meandering Path does not require us to adhere to any particular faith or religion. Instead, its practical, down-to-earth advice offers us simple and straightforward methods to achieve a life of balance and peace.